Now I am here again, and sharing the house with one of Meredith’s friends, a delightful young man who is reading his way onwards through all my books, hasn’t a penny and is technically on the run from the police, being a draft resister. […] He has a very good mind, the kind that turns things over and comes up with the other side of them unexpectedly two days later as though the conversation was still going on. Blessed are the poets who protect the radical, the bright and the brave. Judith Wright’s legacy is based on far more than her lifelong companionship with Australia’s first peoples and/or ‘the conservation movement’, which, by the late-1960s in Australia, had emerged as a unique form of western environmentalism because of its synthesis of conservationism and the Aboriginal land rights movement. As her letter suggests, underpinning it all is Wright’s almost Sapphic exhortation of youth and its liberatory possibilities, and her serious delight in the creative passion of the dissenting intellect. Wright always was sensitive to the radical imagination. But really, isn’t nurturing the penniless avant-garde something we should all embrace? If we sincerely believe in the great life of the imagination, the radiant promise of its daily emergence in literature, music, art, and film, and in deep reflection and complex thought – all those inalienable horizons to being truly human – then we should also step-up and protect the imagination from the many equally great forces that humanity casts against it daily. This has been the signature goal of my past five years as Overland’s poetry editor: to nurture a bright space in which new poets can be heard and celebrated as their imaginations flower and grow. It’s been a real pleasure to judge this prize, which (let’s face it!) 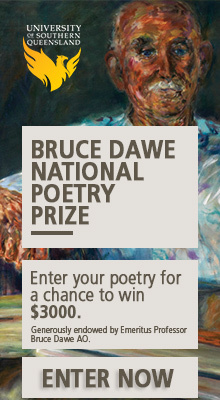 is essentially a well-calibrated mechanism to give away lots of money to wonderful new poets. The Malcolm Robertson Foundation deserves our hearty congratulations for making such a vital and grand gesture of hope and material support to new Australian poetry, one that helps make the very fabric of our shared poetic commons. It’s been an honour for me to be part of that. I bid farewell to Overland with my deep thanks to editors past and present, a warm welcome to incoming poetry editor, the inspiring Toby Fitch, and with congratulations to the winners of this year’s prize. Rage on! Submissions for this year’s competition were assessed blind by Peter and myself. We both read the more than 600 entries, returning with a combined longlist of 34 poems, which were then reduced, over a few weeks to a shortlist of eight, and finally to two runners-up and a winner. Emily Crocker’s ‘Swarm’ uses a well-established allegoryColony Collapse Disorder in bee populations – to remind us that we are a part of the ecosystems we’re destroying, however much we try to set ourselves apart from them: ‘When the world began to collapse, / not one of us noticed. The buzzing …’ In the past tense, in elegant, elegiac lyric mode, and amid the ‘why-oh-why-oh-why’ sirens of human activity, the buzzing of bees is repeatedly stopped, stoppered, faded and silenced until the addressee has her throat and voice sealed by honey. The arc of ‘Swarm’ mirrors this silencing: it builds through the first three stanzas, 10 lines then 11 lines then 12, as if to toll the bell, but slips back to 10 lines in the fourth and final stanza, not quite ready to sound the death knell. ‘Invasion (thirty-five Australian towns, circa 1900)’, by Vito Milana, offers thirty-five long lines, each an imagistic vignette of an Australian town (many with an Aboriginal name) and its inhabitants around the time of Federation. Every line, if separated from the poem and broken up into three lines, could resemble a Japanese Senryu – a distilled observation of people and place. However, the stacking of these long lines, their density of imagery and information filling the page, is key to this poem’s accumulative affect and effect in writing the physical and mental space of Australia: one gets the sense at once of a huge wide colonial land and all its fraught peoples and particularities. The lack of punctuation to end each line means that each town is enjambed into the next, which makes for an invasive and claustrophobic read. Dan Hogan’s ‘Old Growth / High Definition’ is a gnarly poem that follows two young seeming reprobates ‘dragging a TV by its rubbery grey power cord’ through scrub and into a forest of stringy gums, ‘beneath the din of galahparty and breeze’. Their ideas about nature vs. the manmade (‘a damp cut in the forest floor does not appear in high definition / and will heal … and here’s a tree who’s seen tigers and war, but never / billboard shadows chucked on streams of traffic’) crawl and climb through the poem until the two are left speechless, their imaginations grown over with newfangled (yet tangled) notions of the modern and the ancient. ‘in civilisation diminishing’, Geraldine Burrowes employs enjambment to devastating effect to critique a reliance on technology – our detached complicity in techno-capitalism. The poem, scrolling down the page, is like a ‘feed’ in which each line, each new piece of stimulus, is chewed up by the next, connected only by a reader’s ability to freely associate: ‘we stretch to keep track of our de- / vices bought from this child- / labour we feel we can afford’. The poem moves from the promotional and consumable (‘thickets of edible weed isle super appeal’) to the political as machination (‘fricaseed flesh of frack distils dementia’) to the family home as replica (‘give me a moment sighs the mother pile- / driving home / food in the 3D printer’). ‘in civilisation diminishing’ is a machine that spits out ‘sick lines’. ‘Jet Lag Song Nets’, by Jakob Ziguras – a series of six sonnets with overlapping themes – is the most formally grounded poem in the shortlist. Its speaker re-encounters the snowy Polish city of his birth with disappointment and disgust, and with a disenchanted sense of his own education: ‘You wrap the shivered mirror in a leaf / torn from A Thousand Plateaus’. Recurring shards of ice, sun, glass and mirror reflect his shattered expectations. The bathos is tempered by lines with attitude – ‘The polished-concrete sky is wall to wall’ – and by a procession of brilliant and eerie observations. ‘alkaway’, by Ella O’Keefe, is this year’s winner, due to its tight turns of phrase, consistent internal logic, and unusual and intellectual juxtapositions of image, idea and sound. It’s also the winning poem for its deft and open-ended semantic play on a range of themes – from high capitalism, health fads, technology and the law, to the domestic, cohabitation, indifference and the refuse of human consumption. These are themes that recurred in many of the prize entries but which all seem to coalesce in this clever and cliché-free poem by a poet who, clearly, can riddle and extrude the language of health-fetish consumer culture into witty and original lines. This is poetry for the jaded hominid in us, who might normally walk away from ecological problems too big to fix, presuming that our late Anthropocentric world at ‘pearling three o’clock clicks to / night without dusk’.